User selectable time base and range. High/Low set points for each channel. Differential alarm for each channel. Rate alarm for each channel. Selectable Visual and/or Audible notification. Point View can play “WAV” files for alarm notification. User may select a different “WAV” file for each alarm point. Point View can display bitmap image “BMP” files for alarms. User may select a different “BMP” file for each alarm condition. Minimum and maximum readings for each channel. Output to ASCII comma delimited file. All displayed graphs may be printed. Displays readings in the task bar. Runs under Windows® 98, ME, NT, 2000 and XP. Point View is a program that displays data from Point Six wireless sensors. It can display the data as numeric or it can show real time trends on a line graph. Point View can archive sensor data and then later show the data history in a line graph. It also can archive the data to an ASCII comma delimited file. 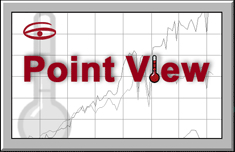 Point View annunciates alarm conditions (like high, low or rate alarm) with visual and audio indicators.